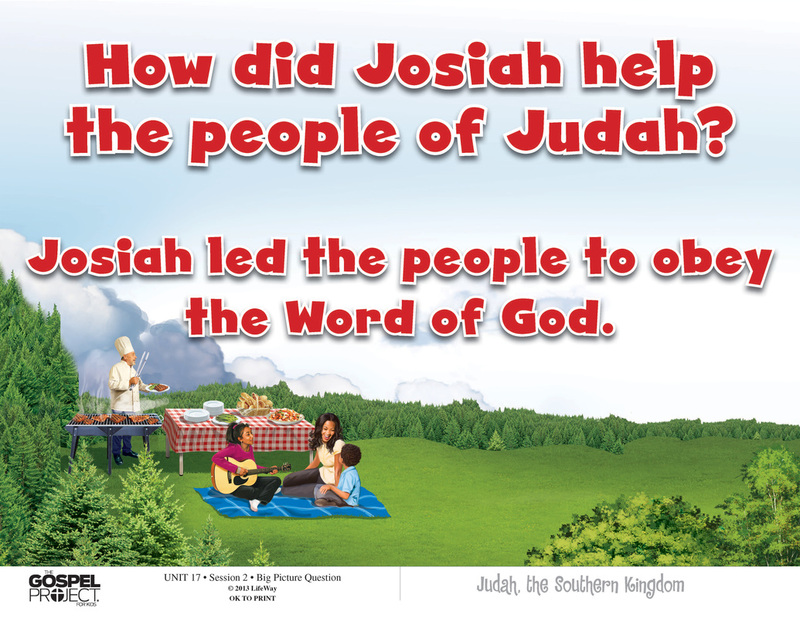 This week in The Gospel Project® for Kids, we take a look at Josiah. Josiah was 8 years old when he became king. His father, Amon, had been assassinated by his own servants, and the people of Judah made Josiah king. (2 Kings 21:23-24) Think of the 8-year-olds you know. Are any of them suited to rule over a kingdom? Josiah did well as king of Judah, and he didn’t step into the easiest of circumstances. His father had been a wicked king, and Judah was corrupt with idolatry. Josiah was not like his father, though. When he was a teenager, he began to seek God—the God of his ancestor David. Then Josiah made changes in Judah. He tore down the altars and idols of false gods, and he began repairing the Lord’s temple. During the temple repair, the high priest found the book of the law of the Lord. The court secretary read the book of the law to Josiah, and Josiah tore his clothes. He knew the Lord’s righteous requirements, and the people of Judah fell short. Josiah gathered the people and read the law aloud. He made a covenant to follow God and obey His commands, and then those listening vowed to do the same. Josiah had great respect for God's law. He allowed God's word to control what he did as a king. 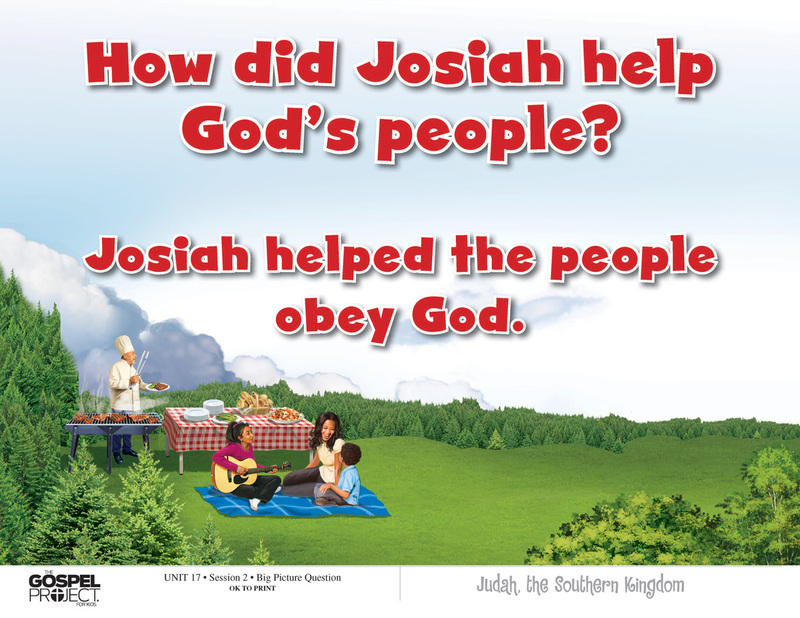 Josiah wanted God's people to love God and obey the law too. 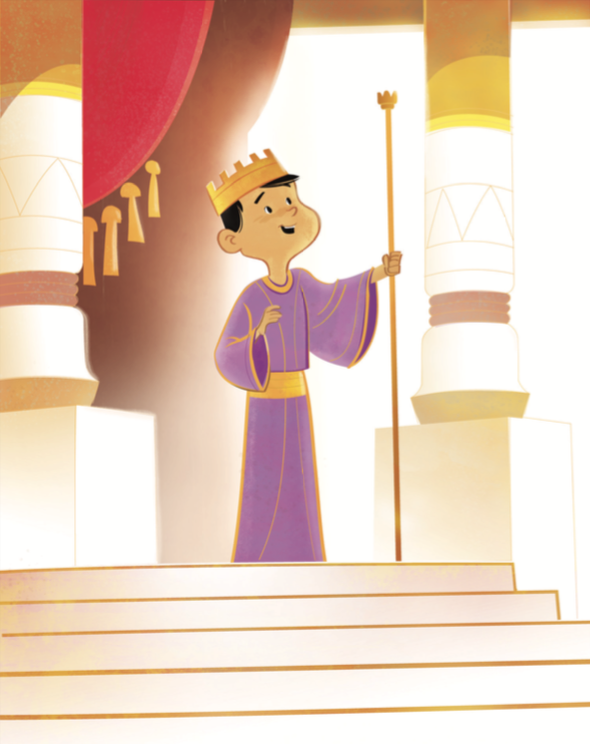 Josiah became king of Judah when he was a young boy—just 8 years old! He was a good king like his ancestor David. Josiah lived in a way that pleased God. He did what was right. When Josiah was a teenager, he started to follow God. And a few years later, Josiah started to make changes around his kingdom. He decided to get rid of the things in Judah that were not pleasing to God. Josiah watched as the people tore down the altars to false gods. They broke the idols and crushed them until they were dust. When Josiah was a young man, he wanted to repair the temple of the Lord. He put three men in charge of making it happen. Money was collected from all the places in the kingdom, and the men took the money to the high priest. The money was for the builders, carpenters, and workmen who would x up the temple and make it like new again. As the temple was being repaired, the high priest found a very important document. “I have found the book of the law in the Lord’s temple!” the high priest said. He gave the book to Shaphan (SHAY fan), the secretary. So the men went to a prophetess named Huldah (HUHL duh). Huldah gave the men a message from God. God said, “I am going to punish the people of Judah because they turned away from me and worshiped other gods.” But God had a special message for Josiah: “Because you were humble and were sorry for your sin when you heard the law, you will die in peace. You will not see the punishment I am bringing on the people.” Then the men told Josiah what God said. all the people in the city of Jerusalem. He read the words of the law that had been found. Then Josiah made a promise to God. He promised to follow God and obey Him like the book of the law said to do. The people at the temple also agreed to follow God and obey Him. And as long as Josiah was king, the people followed God and obeyed Him. of the people of Israel in Egypt and struck down the rstborn of the Egyptians. Christ Connection: Josiah had great respect for God’s law. He allowed God’s word to control what he did as a king. Josiah wanted God’s people to love God and obey the law too. When Jesus came to earth, He ful lled the law by obeying it perfectly.